The standard in solid beeswax votive candles. Expertly hand poured using lightly filtered 100% pure beeswax. Clean and very long burning. Each handcrafted hypo-allergenic votive beeswax candle uses a lead-free 100% cotton wick. Available in natural and a variety of other bright colors. 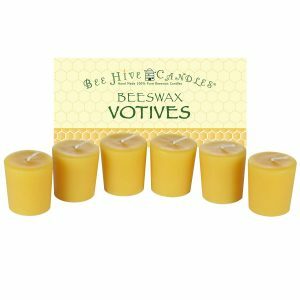 Save 10% when you buy 6 to 11 beeswax votive candle 6-packs, any mix of colors (one color selection per 6-pack). Example: Add to Cart 2 Natural, 2 Red, and 2 Purple and you automatically save 10%. Save 15% when you buy 12 or more beeswax votive candle 6-packs, any mix of colors (one color selection per 6-pack). Example: Add to Cart 6 Natural, 4 Blue, and 2 Purple and you automatically save 15%.